If there is an upside of having early-onset Alzheimer’s, it is that most of us are otherwise in good health. 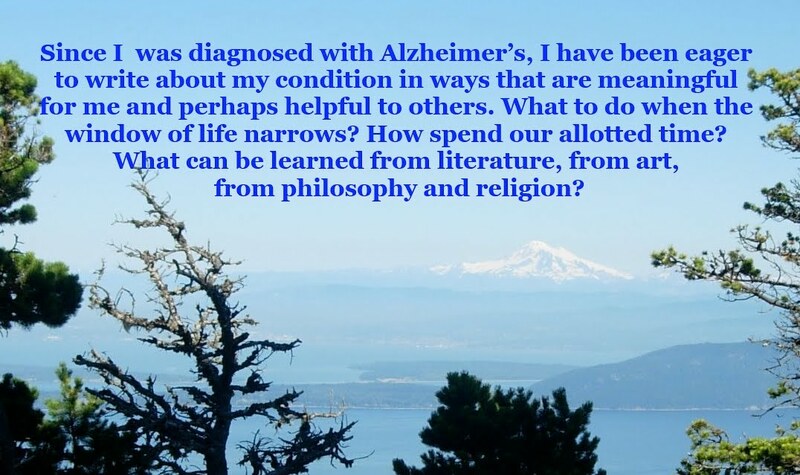 That is much less the case when the disease strikes later in life, as the recent book, One Couple’s Journey With Alzheimer’s Disease: Melting Ice, Shifting Sands, makes clear. Donald, who has had Alzheimer’s for many years, has been showing steady decline for years, and Marjorie, his wife and caregiver, struggles to meet Donald’s many needs. The thread of this story is Donald’s worsening dementia. “Lots of time now I’m not even aware of what I am doing,” Donald acknowledged. He noted an instance in which he turned on a classical radio station, but then soon turned off each of his hearing aids.As a result, “I can’t hear the music, or anyone who might be talking to me. I put my cane down, walked away, and I’m not aware of what I’ve done.” Nor is he always cognizant of the repetitive motions of his fingers and his feet. In another insightful passage, Marjorie recounted her and Donald’s trip to the Currier Museum of Art in Manchester, New Hampshire. The museum also functions as a memory café, a place where people with compromised memory can appreciate art and music. But there is one traditional activity that Donald can no longer fulfill: preparing the house for winter. As Marjorie puts it, Donald “grieves” for the decades for this almost sacred task. “Five and a half years after being diagnosed, life gets more confusing for me all the time as this, which began as a tropical storm and has turned into a full-blown hurricane, continues to take its toll on me as well as those around me. I can usually rise to the occasion with other people, to the point that many don’t realize how compromised my memory has become…. Near the end of the book, Marjorie matter-of-factly states, “The behaviors Donald exhibit go along with late-stage Alzheimer’s. I had been hoping we might escape some of them, since they don’t happen for everyone who gets the disease.” Hallucinations have become common. Donald often asks strange questions, such as “Where will I sleep because there are all these people in the house?” Donald and Marjorie are churchgoers, and as she has observed, Donald “likes to take the hands of women and stroke them, or blow on them if they are cold.” In a separate incident, he patted the rear end of a young woman, assuming he was pushing her wallet back into her pocket, when it was actually her cellphone. “Yes, I laughed later, but I was horrified when it happened,” Marjorie reported. Donald’s narrative ends where no one wants to arrive: the dementia unit in Granite Ledges nursing home. Earlier this month, Newsweek pointed out that people who live in rural areas tend to suffer more from Alzheimer’s than other people with the disease do. The writer, Jessica Wapner, chronicled the decline of a farming community not far from Lake Ontario in upstate New York. The elderly couple Wapner depicts might be described as “salt of the earth.” While Rochester, a city of more than 200,000, is less than 30 miles away, the couple goes there only if it is necessary—for doctor’s appointments, for example. As Wapner recounts, the future couple were born three days apart, and have known each other since they were ten. They married at eighteen, and raised six kids. Not one of the children lives nearby. Among the many medical miracles of the twentieth century, two stand out: the development of penicillin, the first antibiotic, in 1928, which has saved countless lives; and, at the other end of the century, the gradual change, at least in industrialized countries, the breakthrough in the early nineties, leading to H.I.V., the forerunner to AIDS, becoming a manageable condition. A recent article in the journal Scientific American, reissued in a condensed form, may help raise the hopes of people with Alzheimer’s and their loved ones. The recent article’s title—A New Approach to Alzheimer’s—is followed by an intriguing subhead: The disease’s complexity and multiple contributing factors suggest that combinations of drugs could be more effective than single medications. The article, written by James Hendrix, states up front that “Having witnessed the success of combination therapy in HIV, cancer and heart disease, the time has come for Alzheimer’s disease.” As a result of a 2016 meeting with the Alzheimer’s Association and other parties, a consensus emerged that the most effective Alzheimer’s treatments may be those who attack on multiple fronts. With researchers developing a deeper understanding of the disease, the picture emerging is one in which new classes of antiviral medications—“each attacking the virus in a unique way”—doctors will be able to prescribe multiple drugs that have demonstrated efficacy. The Alzheimer’s Association, in collaboration with the Alzheimer’s Drug Discovery Foundation, last year created the Alzheimer’s Combination Therapy Opportunities [ACTO], a vehicle designed to deliver $2 million this year that simultaneously target multiple processes. “An ACTO-funded study must involve repurposed drugs”—those that have been determined safe for using in treating in other conditions. According to the Scientific American article, a combination of experimental anti-amyloid drugs could more effectively reduce amyloid plaque, one of the two typical manifestations of the disease. In another study, the hormone leptin, which curbs hunger, has shown potential to reduce plaque as well as cellular inflammation. The group’s recommendation is to do more research on animal subjects before it is clear that human subjects would not be at risk. As the Scientific American article concluded, “We are at a junction of unprecedented promise in Alzheimer’s research. A few decades ago we knew virtually nothing about how Alzheimer’s developed or progressed.” Will this collaboration bear fruit? If so, it will be a very big deal—as big as what happened after AIDS activists declared in 1991 that Magic Johnson was going to die. And, yes, Magic Johnson is going to die, as all mortals do. I first heard the term “paperless office” when I was working on my campus newspaper in the early eighties. Twice a week our decrepit newsroom resounded with the clacking of manual typewriters. We knew, of course, that we were doing our writing on an anachronism. I wrote my term papers on a sleek IBM Selectric, which my parents bought for me when I was in high school. The novel technology of that period was an insertable cartridge that allowed to correct mistakes in white ink. I first came across a personal computer in 1983. I recall it cost somewhere around $1,ooo, equivalent to almost $2,500 today. Even then, we knew that the newspaper business was in decline. The economic problems of the late seventies and early eighties—first inflation, then recession—led to a joint operating agreement between Seattle’s two dailies. The newspapers continued to strive to outdo each other, but something had been lost. The print edition of the Seattle Post-Intelligencer, the more flamboyant paper, was terminated in early 2009, a casualty of the Great Recession. I have my own reason to favor printed information over pixels on a screen. When I am doing my research for my blog, I sometimes find it onerous to accurately transcribe information from online sources. This should be a simple task, of course, but Alzheimer’s tends to scramble the equation. I work on a Macbook, which makes it easy to take customized screenshots that I intend to quote or paraphrase from—with attribution, of course. The process is tedious, and sometimes confounds me. Using a six-by-nine-inch flip notebook, I transcribe key passages of whatever I happen to be writing about, being careful not to plagiarize. For many years in my thirties, I taught college composition courses for international students, and I was constantly reminding my students the difference between using a quote and using a paraphrase. When I was working on a recent post, I assumed that I was all set. Then I realized I’d written a very similar long sentence later in the same paragraph. Through a combination of bad habits and short-term memory erosion, I can’t always trust myself to do something as seemingly easy as accurately transcribe information from a series of screenshots. I do this on a nine-inch by six-inch spiral notepad. It’s slow going, but since I usually have the time, I don’t mind transcribing the information. Still, it’s humbling to grasp Alzheimer’s progress. The disease moves in only one direction.